PLEASE tell me I am not the only one that utilizes those empty and amazing school playgrounds during the summer time! They are the best playgrounds around and they are perfect to bust out a workout while your kids play. WHICH IS WHY I wanted to bring you guys all new workouts specific for all those playgrounds you are taking your kids to! Okay, let me explain something first. When I do these playground workouts I am ALWAYS the only one at the playground, which is why I love the elementary schools! I know it’s hard to imagine a playground where you are the only one there but I promise you, it happens. Just drive around to the closest elementary school and I bet, 8 times out of 10, there will be no one there. Don’t get me wrong here, I love being social at the playground…ummmm sometimes…when I’m ready and my kids don’t look homeless…which is all the time…so…every once in a while I am prepared to socialize at the park but MOST of the time I just want to find somewhere my kids can go play for a bit so we don’t have to suffer in our home without AC. 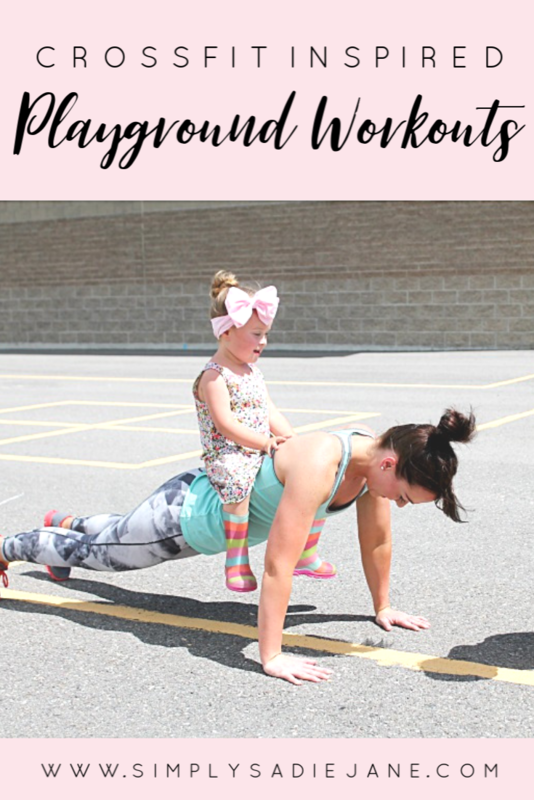 (yeah, I don’t want to talk about it) I guess what I am trying to say is this, why not kill two birds with one stone and workout while your kids play at the playground? Don’t feel like just because you’ve never done CrossFit before that you can’t do these workouts. Be aware of your position and what your body is telling you. Can’t wait for you to get out and enjoy the outdoors while getting in an AMAZING workout! Your warm up is so important. Warming up will help prevent injury. You can use my CrossFit warm up or choose one of your own. I also have YouTube videos you can check out! Be sure to subscribe to get more updates!